Retired Rockhampton Bishop Brian Heenan used these words to describe his 22 years as the diocese’s bishop. Bishop Heenan, who handed in his resignation last year when he turned 75, said at the time he was pleased to continue as the diocese’s bishop as long as necessary. Now he plans to spend some time on the beach, ride his bike, do some travelling and help out around Brisbane archdiocese if required. On October 1, he received news from the apostolic nunciature that Pope Francis had accepted his resignation. Bishop Heenan was also “delighted” the diocese’s vicar general Fr John Grace would be diocesan administrator until a new bishop was named. “John has been a tower of strength for me and the entire diocesan family,” he said. “I also pay tribute to the many other people who have helped me. Mrs Jan Mussig, who accepted the role of executive secretary soon after I came to Rockhampton, deserves special thanks. Jan has accepted many extra responsibilities and has been revered by all who’ve come to know her. 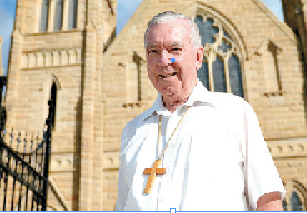 Bishop Heenan, ordained to the priesthood in 1962 and appointed bishop in 1991 by Pope John Paul II, spoke fondly of his years in the “vast and diverse” Rockhampton diocese.